A Karenni environmental group claims that the Burma government blockaded their attempt to join in a protest prayer against the damming of the Salween River last week. Karenni environmentalists from the ‘Love Salween Group’ claim hundreds of Karenni villagers from Pasaung, Loikaw and Ywathit were blocked and denied passage by Burmese authorities to join with other protesters gathering for a prayer ceremony at Wan Awn village. The villagers who all live on the Salween said they where on their way to commemorate the Global Day of Action for Rivers held on March 14. The ‘Love Salween Group’ claim hundreds of villagers who had arrived by boats at the Wan Awn dock were forced to leave by authorities. The ‘Love Salween Group’ spokesperson, Khu Thaw Reh, spoke to Karen News. Villagers from the Salween River valley in Karenni State planned to hold a prayer service to voice their concerns about the building of the Ywathit Dam. Khu Thaw Reh said the government has not included villagers in discussions about the dams. The ‘Love Salween Group’ said permission for the villagers to attend the prayer meeting was sought from the Bawlake district authorities a week before the gathering, but it was rejected. The government owned Datang Corporation of China signed a Memorandum of Understanding with the former Burma’s military regime to build three dams in Karenni State including the 600-megawatt dam on the Salween River at Ywathit. The dam site is located in a previously contested conflict area between the Burma government and the Karenni National Progressive Party (KNPP). Khu Thaw Reh said the upper area of the planned dam site was once inhabited by Karenni villagers who were forced to leave during Burma Army offensives and were forcibly relocated to army designated relocation sites. 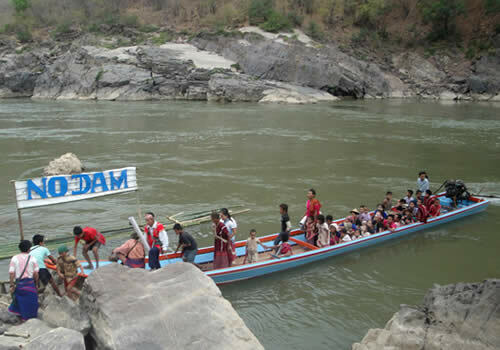 The Love Salween Project urged the government to stop the Ywathit Dam and other dam projects on the Salween River during the transition to peace and democratic reform in Burma.